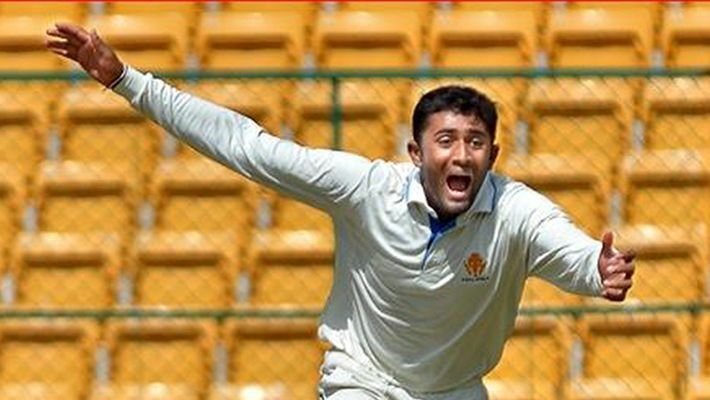 Ranji Trophy: At stumps on the third day, Karnataka were 237/8 in 78 overs at the M Chinnaswamy Stadium. The home team hold a healthy lead of 276 on a pitch which has already started to play few tricks. Bengaluru: All-rounder Shreyas Gopal again came to Karnataka's rescue as his second half century of the match tilted the Ranji Trophy semi-final against Saurashtra in favour of the hosts on Saturday. Gopal, who top-scored with 87 in the first innings, again produced the goods with a fine 61 not out (232 minutes, 134 balls, 1x4, 2x6), which could be a match-winning knock. He and Abhimanyu Mithun (35 not out, 118 minutes, 87 balls, 4x4) frustrated the opposition bowlers with an unbroken 61-run stand for the ninth wicket. At stumps on the third day, Karnataka were 237/8 in 78 overs at the M Chinnaswamy Stadium. The home team hold a healthy lead of 276 on a pitch which has already started to play few tricks. It was a fascinating day's play with Saurashtra bowlers asking tough questions to the batsmen. Captain Jaydev Unadkat led from the front, bowling his heart out and he had figures of 3/35. Left-arm spinner Dharmendrasinh Jadeja too took three wickets (3/77). Left-arm paceman Chetan Sakariya impressed but went wicketless. Mayank Agarwal's catch was dropped off his bowling when the batsman was on 11. He went on to score 46. Just like the first innings, Saurashtra bowlers began well. They reduced Karnataka to 52/3. Then Agarwal and skipper Manish Pandey steadied the ship before Jadeja struck in the post-lunch session, trapping Pandey LBW for 26. Soon Agarwal fell, bowled, to a peach of a delivery from Jadeja. Karnataka were 176/8 when Gopal was joined by Mithun and they ensured that there was no further damage till the end of the day. Saurashtra bowlers tried everything to separate the duo but did not succeed. Saurashtra had chased down a record 372 to win their quarter-final against Uttar Pradesh. Now, they have to produce another such effort if they are to reach the title clash against Vidarbha. Karnataka will be wary of Saurashtra and more of Cheteshwar Pujara. The hosts will be hoping to go past the 300-run mark and hold on to the advantage when they return on Sunday. Earlier, Saurashtra were bowled out for 236 in 71 overs, conceding a 39-run lead. They had resumed at 227/7. Ronit More finished with 6/60 while Mithun took two wickets in two balls for 3/46.